Everything from music hall, musical theatre, classical, exams, auditions & recitals, to jazz, blues, and standards on oboe. 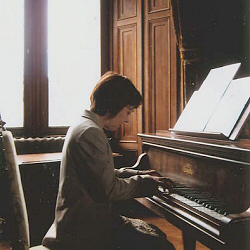 Gail Ford is a pianist/accompanist/oboist, based near Cambridge but working throughout the UK and Europe. Gail studied at Manchester University, and later privately with teachers such as Nina Walker, Gordon Back and Clifton Helliwell. Her performing experience ranges from music hall to grand opera, including recitals, auditions, rehearsals and silent movies. She has played in many prestigious venues including the Barbican, South Bank Centre, the Fitzwilliam Museum Cambridge, the Embassy of the Czech Republic and the Italian Consulate, and her clients have included English Heritage, The Fitzwilliam Museum Cambridge, wedding parties, music societies, corporates, Cambridge colleges and cinemas. With the Collaborative Orchestra and Singers, she was a semi-finalist (oboe) on Britain’s Got Talent 2016, also took part in the 10 Day Orchestra Challenge in London, and recorded an album in a day with the Challenge team in Paris. She performs for rehearsals, performance, auditions and functions, is company pianist for the NODA award winning Saffron Walden Musical Theatre Company, and also the voices of Serenata Choir. Get in touch to check availability and discuss fees. Because You Asked Me… Gail Ford’s music is now available to download or buy online on the Really Good Music site. — Anthony Halstead, horn player, professor & conductor. Originals and arrangements for sale, with Sheet Music Plus.